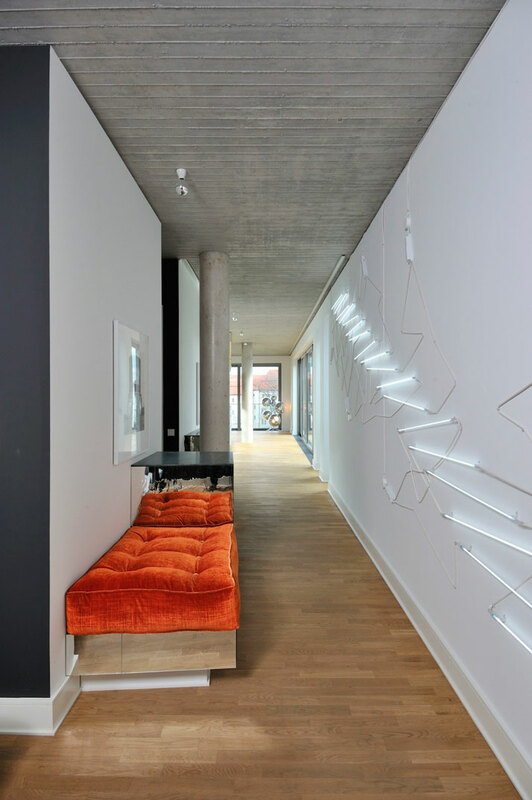 LecaroliMited is an architectural office known for its surprising and flamboyant designs. 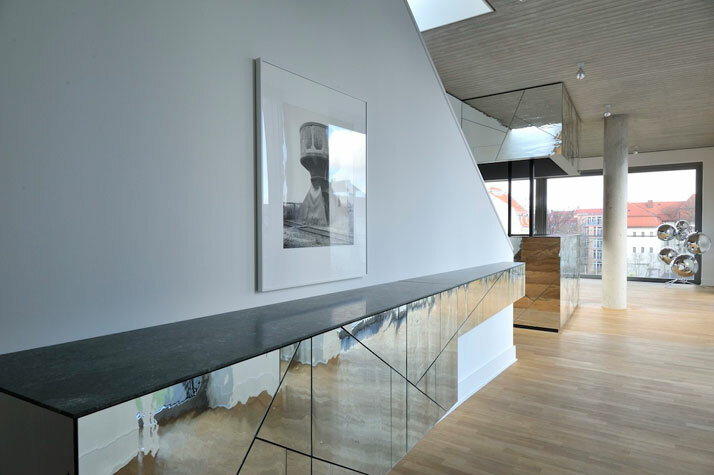 Founded in 2005 by Oskar Kohnen and Fabian Freytag , this practice came to our attention in 2010 with the completion of a private residence that did not go unnoticed. A residence with a flamboyant character which is very particular, quite simply you either love it or hate it. 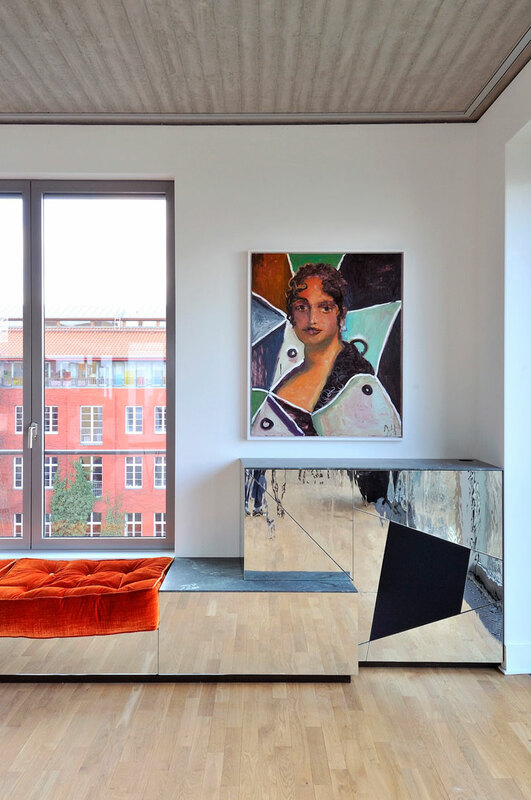 This Berlin based 400sqm penthouse is broken up into two levels and the key phrase here is ‘retro bling’. 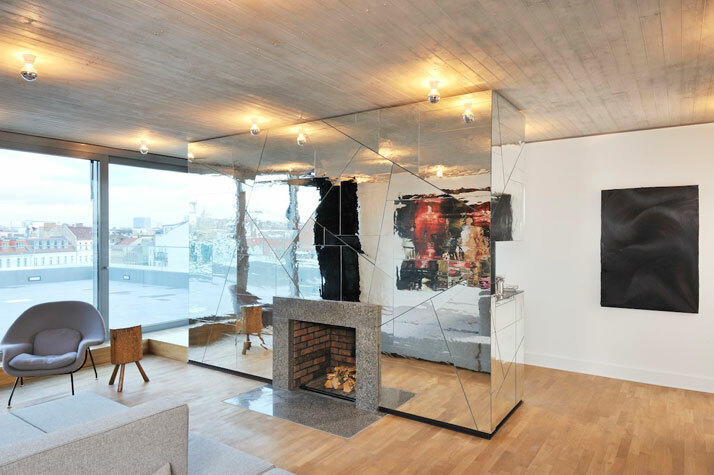 In order to retain the much wanted concept of an open plan interior, the designers created the idea of boxed structures to incorporate all that was needed for entertaining level with glitz and glitz and more glitz. 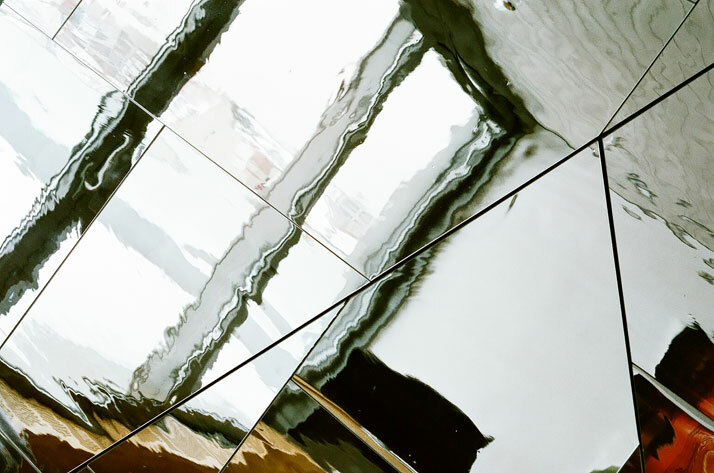 These mirror belt details create a tradition of loos-ian sensuality whilst feeding identities and incorporating a likeness with a mythical symbolism of the distorted truth. 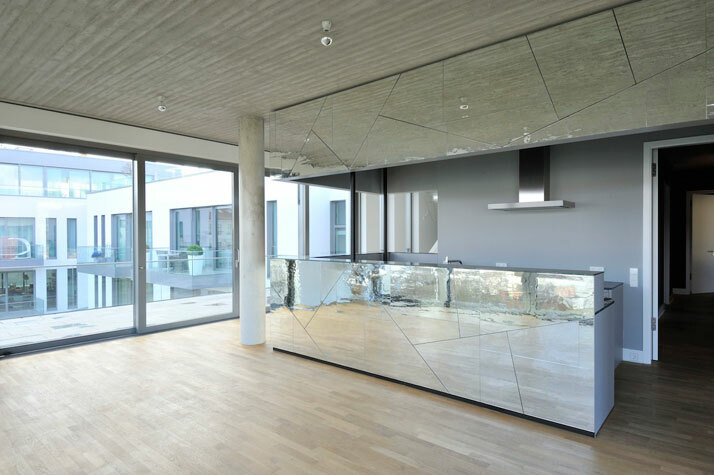 These features were all constructed on-site made out of small and non uniform pieces of bespoke custom painted glass. What surprised us was that each single piece was split BY HAND, now that is what we call devotion to labor. 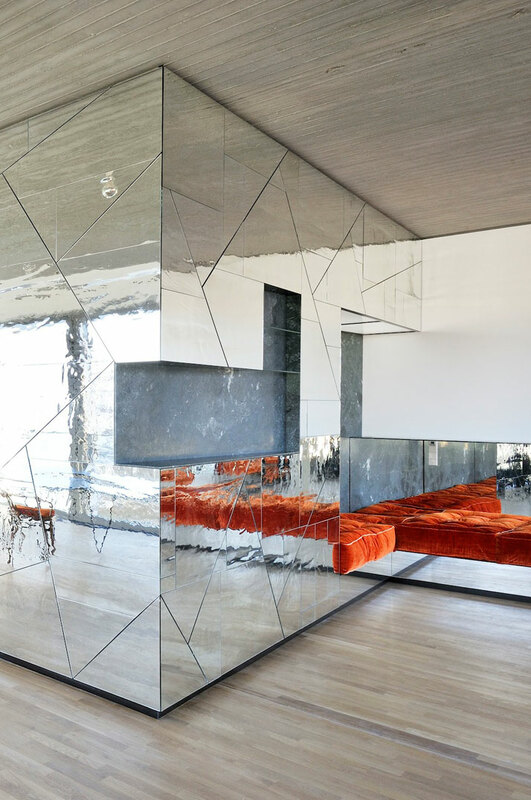 Through these irregular finishes the whole interior surrounding reflected space, is constantly distorted and viewed in other whole different perspectives. A permanent illusion within a space is created with a mere turn of your head. Nothing is like it seems and it never is. The purposeful selected bright fabrics create vibrant tones which together with the distortions create a prefect Alice in Wonderland vibe. 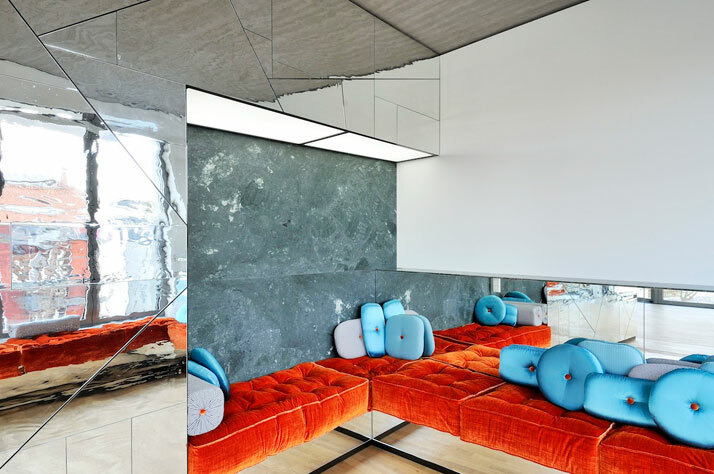 Vibrancy, shapes, sizes and forms certainly introduce an indoor entertainment of their own. These same irregularities in shape and form are also present in the furniture pieces, which were custom designed for the residence. 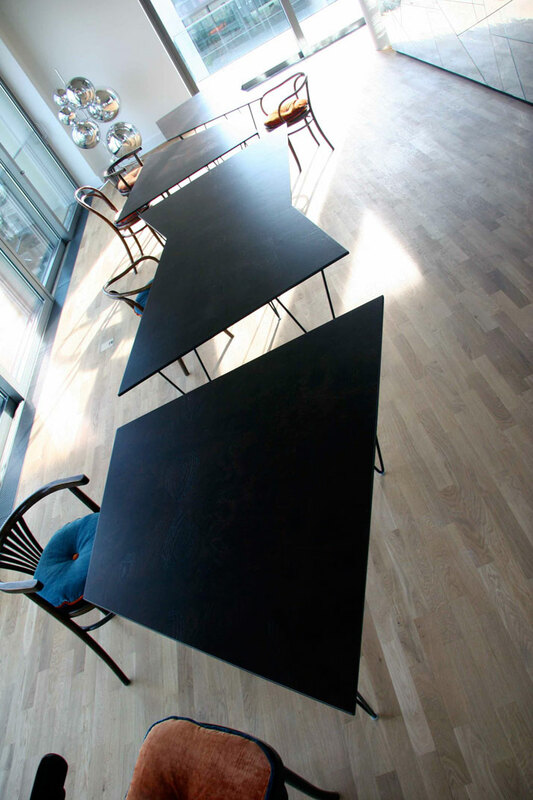 The dining table has multiple configurations either as a 6 meter long piece or four smaller parts which is a flexibility which needs to be allowed in dining entertainment. This dynamic profile generates a different view for each guest, and in contrast to most six-meter tables, establishes no hierarchy. 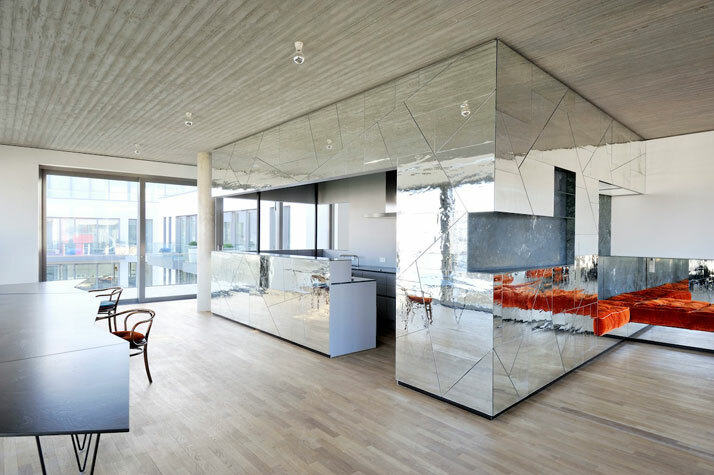 After all, this is one residence where your vanity can be fulfilled through architecture. 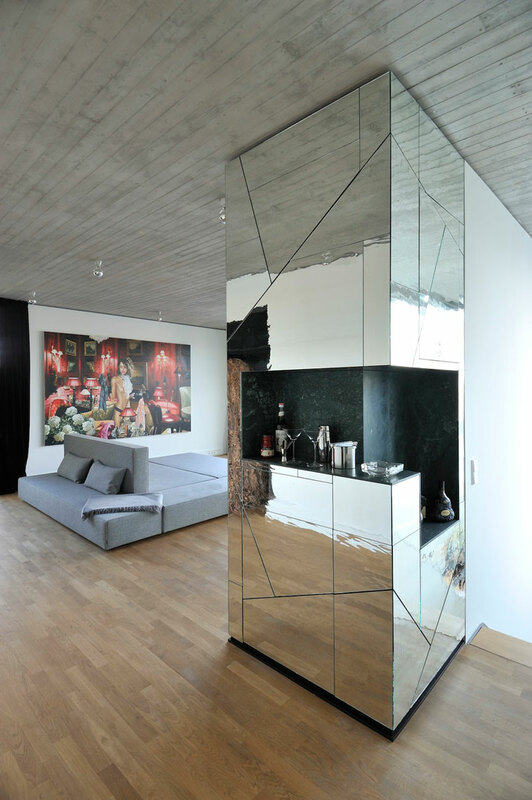 In order to control the sharpness and robustness of the mirrored form most selected furniture pieces are upholstered expressing comfort and softness to counter balance the sharpness. This contrasting effect was certainly needed isolating the forms of engagement from those of static and conceptual perception. 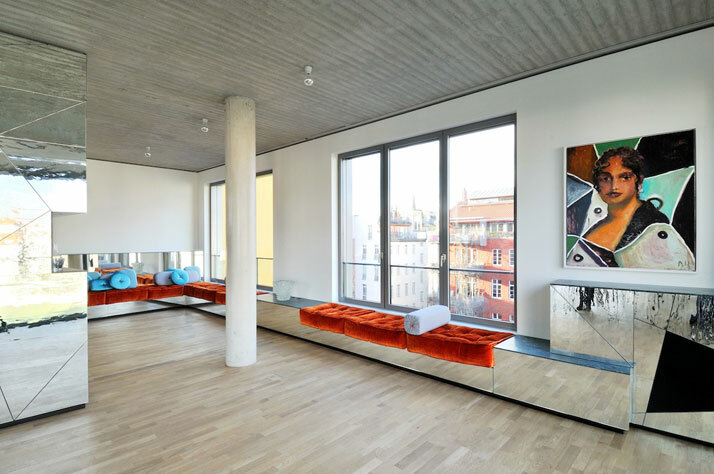 Walking through these interiors you almost feel like being part of an art gallery where sitting is mostly in the surrounding perimeter of the structure and the artwork is dominant placed within the central space. These built in benches are present throughout the residence isolating the engagement of conversation to three people. The idea is to mingle, change discussion and entertain. 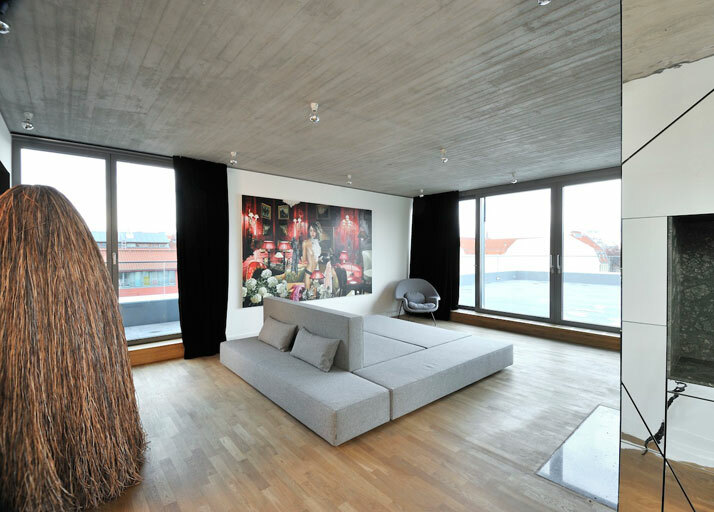 The upper level of the penthouse on the other hand, is very private. 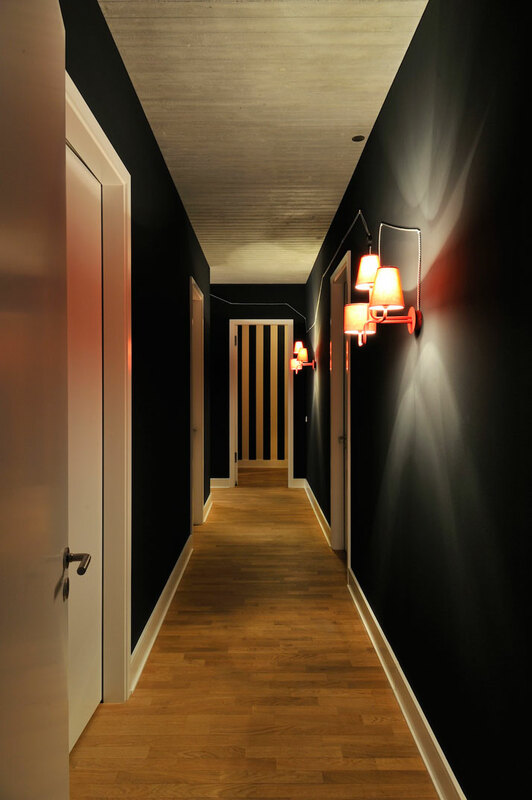 Dark atmospheric corridors with white door framing create a wonderful atmospheric feeling. The artistic exposed power cabling is rhythmical and reminiscent of another era and even more another residence. Walking up from downstairs, the greeting concept is made up of two divides. 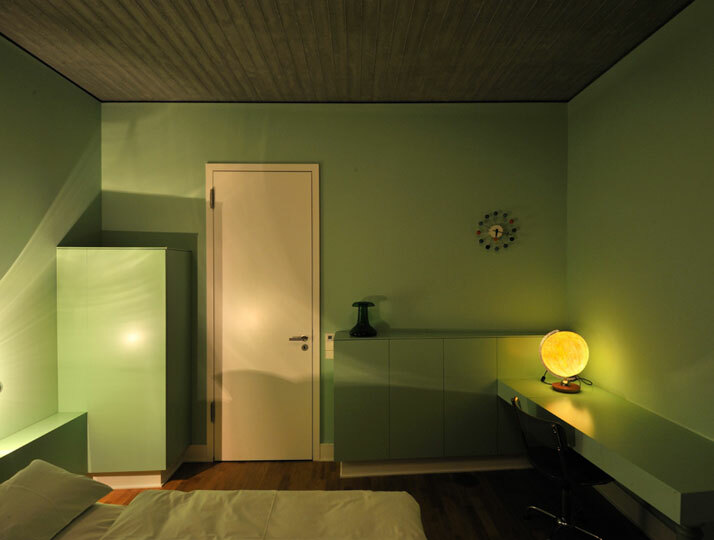 This darkened journey leads to separate colourful bedrooms. However the divide is at the same time brought together through the existence of a black and white palette broken up by vibrant colours on the outskirts. All in all, it makes for an emotional journey that is incorporated through palette and architecture. It is fascinating the amount of power that architecture can have in your personal future. Architecture can bring people together and at the same time tear them apart. The big secret is, to know what you are designing and how you want your personal ending to read. For this residence we know one thing for sure, no matter what the ending will bring, it will definitely be re-lived over again and again.